I travelled to Patagonia at the end of January, 2006, on a two week tour led by GAP Adventures. These notes are provided in the hope they will inform other travellers and perhaps even amuse them. See also my page of Photographs from Patagonia. I prepared for the trip by buying a copy of the Moon Patagonia handbook (by Wayne Bernhardson), a Lonely Planet Latin America Spanish phrasebook, and reading Charles Darwin's classic Voyage of the Beagle. I read the Moon handbook before the trip to try to understand what to expect, and I think it was more or less accurate, but I didn't use it much on the trip itself, but only because the Gap tour conductor was so well informed. An independent traveller would certainly want it. The phrase book was very helpful. It let me build on the fragments of Spanish I could recall from high school. I'm glad I brought it. I also brought a pocket Spanish dictionary, but never used it, even when I did (attempt to) have conversations in Spanish. As for Darwin, his book is worth reading on its own merits, but not as a preparation for the trip. He's a fine writer, he made some important geological discoveries on his trip, and, of course, he's one of modernity's most influential people. Still, other than the Beagle Channel, he did not go to any of the places we went, so you can't read it and hope to compare your own experiences to his. Indeed, the parts of Patagonia he did see, he mostly disliked: "the plains of Patagonia...are pronounced by all wretched and useless. They can be described only by negative characters; without habitations, without water, without trees, without mountains, they support merely a few dwarf plants." (Chapter XXI), though he did also pronounce them unforgettable. I also had a look at the Wikipedia article on Patagonia, but it's mostly taken from an old edition of the Encyclopedia Britannica, and not very helpful. By contrast, I found Bruce Chatwin's book In Patagonia irrelevant. He didn't visit any of the places I wanted to see (indeed, maybe that's his point), and I didn't find his prose style worth reading for its own sake, either. My trip began in Buenos Aires. My flight from Toronto to Buenos Aires (via Houston) was long, but uneventful. The long leg from Houston to Buenos Aires was more than eleven hours, but it was a night flight, and I was able to sleep fairly well. Entry into Argentina was smooth. The only advice I have for the traveller is to not change money at the money changing booths at the baggage claim, but instead to wait until clearing immigration. The first booths offer a poor exchange rate, and you don't need Argentinian money until you clear immigration. There are offices of the National Bank as soon as you clear security, and they offer the normal rate. GAP had already arranged a hotel for me, and it was right downtown, on Rivadavia, just north of the Ave de Mayo. I set out to explore the city. Buenos Aires is hot in January. The temperatures were around 33 (C) during the day, and the city offers little relief. Coming from Toronto, I expected to find water in all the parks, and I also expected to see more grand fountains, but I didn't find them. Luckily there are stores everywhere ready to sell you water, and it's not too expensive. It's also very easy for the traveller to keep in touch with home. Locutorios (stores selling phone calls and/or Internet access) are ubiquitous and cheap, far cheaper than internet access ports in Canadian or US airports. I began walking, and immediately got turned around. This happened more than once in my stay, and my guess is that the reason is that in the Southern Hemisphere, the sun is in the North, not the South. It was hard for me to read the economics of the city. There are an awful lot of stores, and they all seem to be selling things. The people on the street seem comfortable and happy. There are a lot of babies about. Yet the sidewalks downtown are in bad repair, such that you really need to pay attention where you walk, though they're being fixed in some places. I didn't see a lot of homeless or street-people, but I did see children - young boys - begging. They would stand in front of cars stopped at traffic lights, and juggle - sometimes five balls, which is not at all easy - and ask for coins. I don't know how well they were doing, nor do I know whether they were begging for a living or just for spare change. My first destination was the Plaza del Mayo, site of the protests by the Mothers of the Disappeared against the military regime. The plaza was much smaller than I had expected, and (on Saturday) contained only a few crafts vendors, a few tourists, and a lot of police. I don't know why there were so many police, except that the plaza is immediately next to the government house, and it's clear from the grafitti that there are still protests of some form occuring, though for all I know the grafitti represents the work of two or three disgruntled Marxists, not a movement. I tried to visit a few synagogues, but wasn't very successful. The first one I went to, the Templo de la Congregacion Isrealita, near the Teatro Colon, was closed, although it was Shabbat At least that's what the guard seemed to be saying. He seemed unimpressed when I told him (in bad Spanish) that I was a Jew myself, and told me to "come back tomorrow". I had no better luck with other synagogues on other days. Those that were open had suspicious looking guards in front, and they didn't seem eager to converse with me or invite me in, and even those that were closed were guarded by police. This is a legacy of the bombings of the mid 1990s. In short, you can't expect to just drop in on a shul in Buenos Aires. On the other hand, one Sunday I stopped in at a kosher bakery and had a nice chat with one of the workers. He spoke excellent English, but he was mostly interested in discussing airports -- he asked me detailed questions about Toronto's City Island airport, although he'd never been to Toronto. He was planning to open a flight instruction school, and I guess he just liked to fly. I walked out to the Museo Argentino de Ciencias Naturales (the Museum of Science), hoping to see something about the geology of the places I was going. The Museum has a terrific collection of rocks and minerals, some very impressive meteorites, and some great dinosaurs, but not much on geology per se. It's also labelled almost entirely in Spanish, and my phrase book wasn't much help. Sunday I started off by subway, feeling no need to add extra miles of walking in the heat. The subway system is fast (though not as fast as Toronto's), and cleaner than those of many American cities. I did notice in one station a shrine to Maria tiled into the wall, with a prayer for guidance from Heaven, and places to put flowers. Argentina does not have the same separation between Church and State that I'm used to. I got off near the famous Recoleta Cemetery. This is the place where the rich, famous, or well connected are buried. Many of them have elaborate tombs, richly carved, but some of the tombs are broken down, and perhaps have even been broken into, though why anyone would want to do that isn't clear. It's a major tourist draw, especially the tomb of Eva Peron. My next stop was the Museum of Fine Arts. There I saw amazing work by local sculptor Jorge Gamarra. Many of his pieces were granite, carved into shapes as if it had been bent, twisted, or deformed by impact. I found this quite funny, as it's kind of a joke on the material. It's true that granite can fold, but not under conditions where we can live. I tried to draw some of the pieces, but they're really hard to draw because they're so polished, and the shapes are so unlikely. On the floor above I saw some exquisite pieces by pre-Columbian peoples, some from as early as 1500 BCE. Some of them were used for preparing a hallucinogenic beverage from the cebil tree, and looking at the pieces, which are vases in the shape of figures with both human and animal aspects - I could see that it's true. The rest of the second floor includes works from colonial times through modernity and into the 20th century. One picture made a strong impression on me. 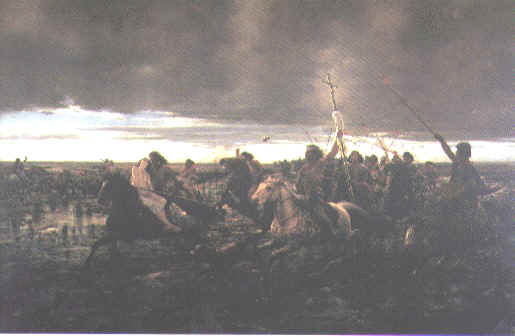 La vuelta del malón, by Angle Della Valle, shows a band of marauding Indians galloping through a marsh in triumphant return from their raid on a European settlement. They carry booty looted from a church, and a half-naked white woman who has swooned in the saddle of her captor. Mud splatters everywhere, including the white dress of the captive. It's impossible to read this as anything but propaganda, but the sign near the painting also tells us that the painting was made after the native people had all been subdued. Another impressive work is titled "sin pan y sin trabajo" (no bread and no work). A workman sits at a table with his tools. A woman sits across him, holding a baby. Through the window we see a factory, idle. My words can't do justice to the power of this piece. I regret I don't know the name of the painter, thought it might be Ignacio de la Carcova. Sunday night at the hotel I met all my fellow travellers, eleven in all, plus Ben, our tour conductor. This was our offical "day one" for the trip. Ben organized a brief meeting. He provided us with wine, cheese, and bread, while he outlined the plans for the trip. We all went out for cheap pizza after that, and the next morning, bright and early, we flew to El Calafate. Our trip to El Calafate (Monday, day 2) took longer than I liked, because we flew via Ushuaia, and (for reasons unknown to me) made an extra stop in Trelew. I couldn't see a thing from my seat, so I have no idea what the land looks like in-between. The terrain around El Calafate is dry and flat. Being on the eastern side of the Andes, Argentinian Patagonia gets little precipitation, and there don't seem to be any efforts at irrigation, either. Perhaps the land is infertile, so it's no use? Coming in from the airport, you see that you're in a valley (carved by the glacier when it was larger). The valley wall shows mostly flat strata, rising slightly as you approach the town. Looking further west you can see some mountains, and it becomes more obvious what might have tipped these otherwise flat rocks. El Calafate itself is clearly a tourist town - there's a huge construction boom going on to house the tourists, and the main street is a succession of shops for the tourist trade - jewelry, camping gear, chocolate, restaurants, fancy clothing, books, crafts, and then more of the same, for five or six blocks. Very few stores seemed intended for the locals. Monday evening I had my first experience of the Argentine parrillada, meat grilled around an open fire. The portions are so huge as to be absurd. I ordered lamb and got a platter perhaps 18 inches across, heaped two to four inches tall. Now some of that was bone, but it was still an impossibly large amount of food. Even on the days when we hiked (see below) it was an impossible amount of food. I really don't know how they do it. Tuesday morning (day 3) we saw the first of the sites we'd come to see, the Perito Moreno Glacier, in Los Glaciares National Park. I've written about the glacier elsewhere, so I won't repeat it here. The rocks in the vicinity of the glacier are intensely bent and folded. Some strata are nearly flat, and others, just a few feet away, are tipped to the vertical. I could see small faults in the strata along the lake shore. In the evening we rode a bus to El Chalten. Just after we crossed the Santa Cruz river, I saw a huge erratic boulder, left by a previous period of glaciation. The sun set as we drove. In the distance I could see Fitz Roy in the sunset, a triangular tooth in the sky. We entered El Chalten in darkness, and I could see little of the town or its surroundings. We stepped off the bus and into the lobby of the youth hostel. Loud dance music (and I don't mean tango) was blasting from a sound system that would suffice for a rock band. Young people were crowded around narrow tables, eating and drinking. This was clearly a youth hostel. Luckily, the bedrooms were well insulated from the lively din in the lounge. I stepped outside to look at the stars. I found the Southern Cross. To the north, I saw Orion, but upside down! In the morning (day 4), I saw the land we'd driven into in the night. El Chalten sits in a narrow valley, with steep cliffs of volcanic rock rising on either side. A river runs along one edge of the valley, with the town to the south of it. If the town was this already so lovely, how much better would the hikes be? Laguna de Los Tres. Click for a larger view. Our first hike was to Laguna de los Tres, about 24 kilometers round trip (15 miles) with a climb of roughly 850 meters. The hike began with a moderate climb, but soon levelled out. After about an hour, we got our first glance of Fitz Roy. At this point in the journey we had no idea what kind of weather we might be getting, so everyone stopped to take a picture at the first chance they got, even though at that time the top was covered in cloud. After a while we came to the Poincenot Camp, then crossed the Blanco (White) River, and arrived at the Base Camp, reserved for climbers. From here the trail got a lot steeper, and for the next hour we went up the face of the terminal moraine. At the top, we had a fine view of the Laguna. On the trail back, I got a good look at the wall on the east side of the valley. I saw what appeared to be a giant angular unconformity, with basement tilted almost vertical, topped with flat strata. Our guide identified the basement rock as Carbiniferous, and the topping as Jurassic marine sandstones and shales. 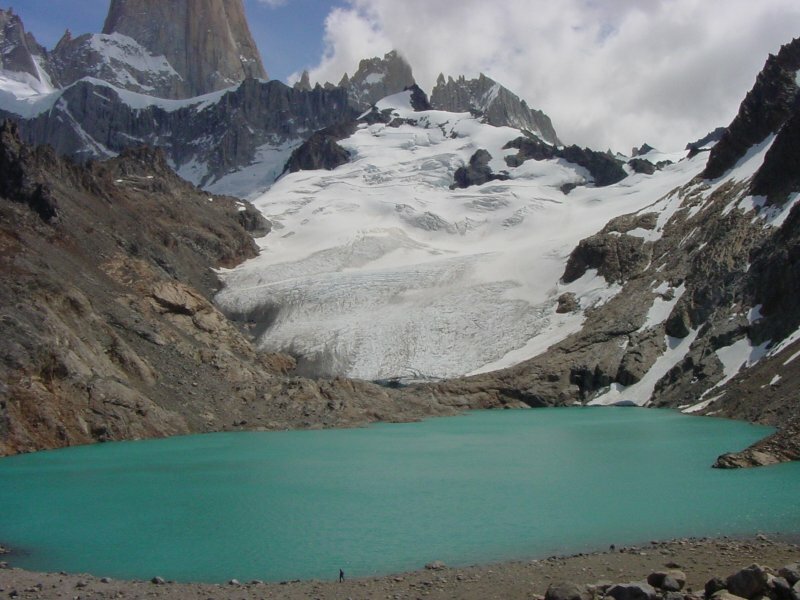 Fitz Roy River, flowing from Laguna Torre. The next day (Thursday, day 5) we walked to Laguna Torre, a shorter (20 kilometers) and easier (250 meters of elevation gain) walk. 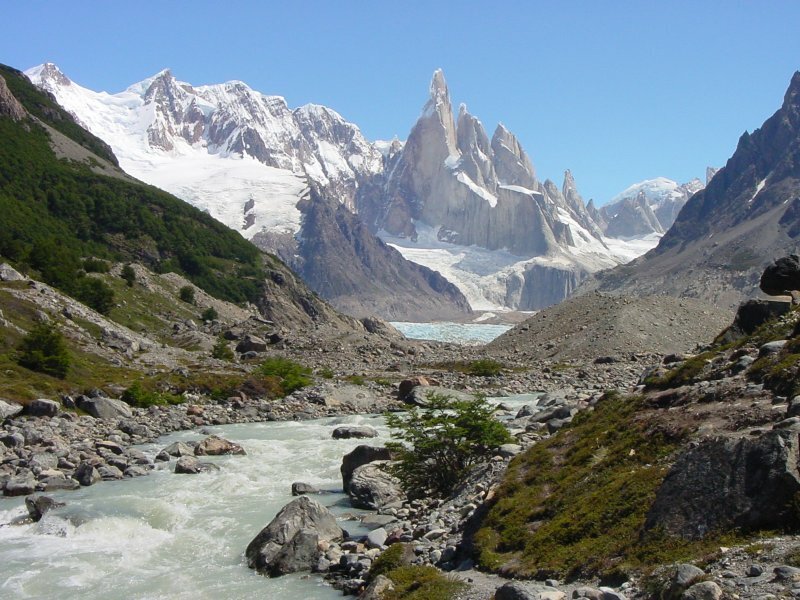 Most of the walk follows the valley of the Fitz Roy river. The valley floor is flat (filled by glacier). On the left as you walk up it you see a huge recumbent fold, where strata are folded into a giant U. The mountain is named Pliegue Tumbado, which is Spanish for "Recumbent Fold". Again, according to the guide, the lower levels are Cretaceous marine sandstone and shales. A little further up you see an immense thrust fault where older Jurrasic rock has been shoved up over the top of younger Cretaceous rock. The terminal morraine is not nearly as steep. Once you reach the other side though you are exposed to a blast of wind coming down off the glacier. Luckily, hikers have built a crude rock shelter. In the morraine I saw (among others) shale with quartz infusions, granite (from the peaks), rhyolite, and dacite. I couldn't have identified the latter two, but the guide did. We hiked back to the hostel, quickly took showers, and got back on the bus to return to El Calafate. Friday (day 6) we rode across the border to Chile, to Puerto Natales. The bus route was more or less flat, heading south over the Patagonian steppe. We passed though the coal-mining town of Rio Turbio, but the bus stopped only long enough to take on a few passengers. Puerto Natales, at 51 degrees 43 South, is a full degree of latitude further south of El Calafate, but only slightly west of it, and actually to the east of El Chalten. The town sits on the Seno Ultima Esperanza, (Last Hope Sound), which leads to the Pacific, but it's still to the east of the Andes themselves, which are more like islands than mountains here. We got into town too late to head for the mountains, but with enough time to explore. Unlike El Calafate and El Chalten, Puerto Natales is a real town. Tourism is clearly a part of the economy, but it's not the only part, and most of the people I saw looked like they lived and worked there, year round, and they didn't look like they were in the tourist industry. There were plenty of shops catering to tourists, but plenty more that sold to the locals (hardware, school uniforms, car parts, that sort of thing.) It was a big relief to me. Saturday, February 4 (day 7) we got into a van and drove into the park. Coming next: Cuernos del Paine.